The possibilities on the web are truly limitless with blogging platforms and easy online plugin systems that allow users to customize and create just about any type of website they wish to have. Many parent bloggers have taken this to the next level, by branding themselves and earning money through blogging. Wayman Publishing and the authors of "The Blogger's Survival Guide," are proud sponsors of an upcoming blogfest that will feature these inspiring parent bloggers and offer them a chance at publication. What's a blogfest? Simply put, a blogfest is when many blogs unite, agreeing to write about the same topic on the same day(s). "This blogfest," says a Wayman Publishing Co-Founder Elisabeth Hirsch, "is to encourage bloggers to write inspirational stories about parenthood. Any bloggers who'd like their posts reviewed, will have an opportunity to be published in Wayman's upcoming anthology." "Bloggers are now a dime a dozen," says Lexie Lane, co-author of 'The Blogger's Survival Guide.' Everyone has a chance to speak freely and spread their interests if they play their cards right." But what these bloggers don't often have, is a chance for their stories to be published by a growing press. Wayman Publishing, Lexie Lane and Becky McNeer are hoping that many people will write inspiring posts about their own experiences being a parent or about being nurtured as a child. All posts during this blogfest will be considered for inclusion in an upcoming anthology. 50% of profits from this project will be donated to charity. 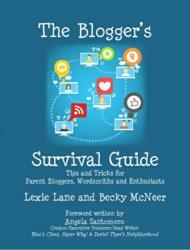 This blogfest will also serve to help promote Lane's and McNeer's blog book "The Blogger's Survival Guide." When asked what Lane's challenges were and the reasons for her determination toward the completion of her book, she said, "I took the wrong path when I started blogging and now see others repeating the same mistakes. I was determined to help those I could by guiding them through the steps of social media blogging so that confidence can replace the feeling of being overwhelmed, as most bloggers describe the activities of blogging." Lane isn't alone in this determination to help others. Her co-author, Becky McNeer, also has a mission to inform the world about the proper use of blogs and social media. Together, teamed with Wayman Publishing, Lane and McNeer are eager to encourage other bloggers to succeed, whether that be through sharing tips and tricks, or even by helping others have a shot at being published.